This beautiful home in Oxford, England is having a bit of difficulty finding renters. It has 3 bedrooms and it is located in a very desirable location. There has to be some sort of reason why nobody seems to show any interest in this home. The Headington shark first appeared on 9 August 1986. Bill Heine, a local radio presenter who owned the house until 2016, has said "The shark was to express someone feeling totally impotent and ripping a hole in their roof out of a sense of impotence and anger and desperation... It is saying something about CND, nuclear power, Chernobyl and Nagasaki". The sculpture, which is reported to weigh 4 long hundredweight (200 kg) and is 25 feet (7.6 m) long, and is made of painted fibreglass, is named Untitled 1986 (written on the gate of the house). The sculpture was erected on the 41st anniversary of the dropping of the atomic bomb on Nagasaki. It was designed by sculptor John Buckley and constructed by Anton Castiau, a local carpenter and friend of John Buckley. 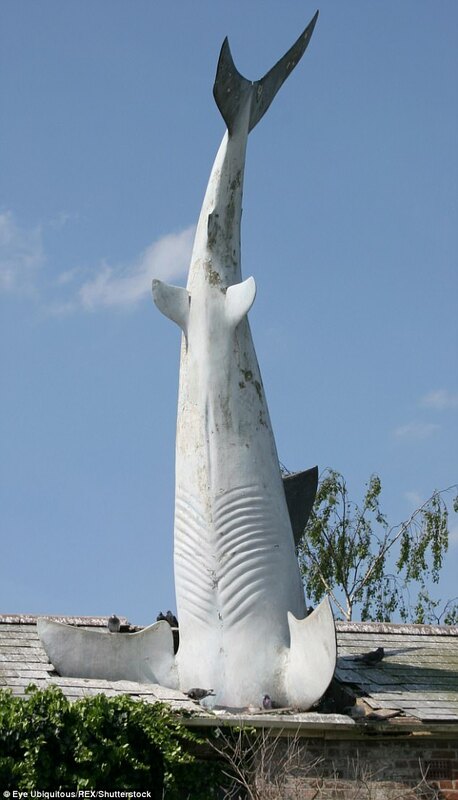 For the occasion of the shark's 21st anniversary in August 2007, it was renovated by the sculptor, following earlier complaints about the condition of the sculpture and the house. In 26 August 2016 Bill Heine's son Magnus Hanson-Heine bought the house in order to preserve the Headington Shark. The fibreglass shark is 25 feet high… the same length as the shark in the original Jaws. Bill Heine, owner of the Headington shark house. Heine has been looking for a new tenant since before Christmas, but has yet to find the right person. “I’ve had a lot of inquiries but found no one right. “I’m looking for somebody who will be willing to be part of the community, be able to take care of something that has a status well beyond the street,” he says. The Headington Shark is on Oxford’s tourist trail, despite being far from the city centre’s ancient colleges and cobbled streets, and visitors come from as far afield as South America and Japan. If you’re up to the challenge, the “Tardis-like” house has three en-suite bedrooms, and is available for £2,300 per month with Chancellors (01865 763464; chancellors.co.uk). Wonder if has a back garden or yahd? Rumours of a $10,000 deposit upfront are said to be untrue.